SUSMIN THOMAS, GEORGE MOHAN, MILAN JOSE THOMAS and NAVANEETH R. "Study on Intersection at 26th Mile, Kanjirappally." Journal 4 Research 2.7 (2016): 1-4. NISHA MATHEW, GEENA G. PRADEEP, KRISHNA PRIYA SUKUMARAN, GEORGETTE GEORGE and FEBIN MUHAMMAD. "Removal of Dissolved Solids in Waste Water Using Activated Carbon from Coconut Shell." Journal 4 Research 2.7 (2016): 5-7. Anand Singh. "Security Threats in Sensor Network in IOT: A Survey." Journal 4 Research 2.7 (2016): 8-11. Sarath S Nair and Faisal M H. "Fabrication of lM6/B4C/GR Aluminium Metal Matrix Composite." Journal 4 Research 2.7 (2016): 12-17. Pooja Sahastrabuddhe and Dr. Hari Kumar Naidu. "Harmonic Analysis of Three Level Diode Clamped Inverter." Journal 4 Research 2.7 (2016): 18-23. V. Prasanna and S. Bharath. "Paper on Weldability of H30 Aluminium with BS970 Mild Steel using Friction Welding Process." Journal 4 Research 2.7 (2016): 24-28. Didymose Poovathumkal, Jomon Joy and Ansal Muhammed K. "A Study on Mechanical Properties of Treated Palm Seed Fiber Epoxy Composite." Journal 4 Research 2.7 (2016): 29-34. Bhushan Kudegave and Prafulla Deshpande. "Design and Analysis of Cotton Seed Separation Machine by using Reliability Index Approach." Journal 4 Research 2.7 (2016): 35-39. Pragnesh T. Patel. "A Review of Probabilistic Reliability Analysis of Wind-PV Hybrid Power Systems." 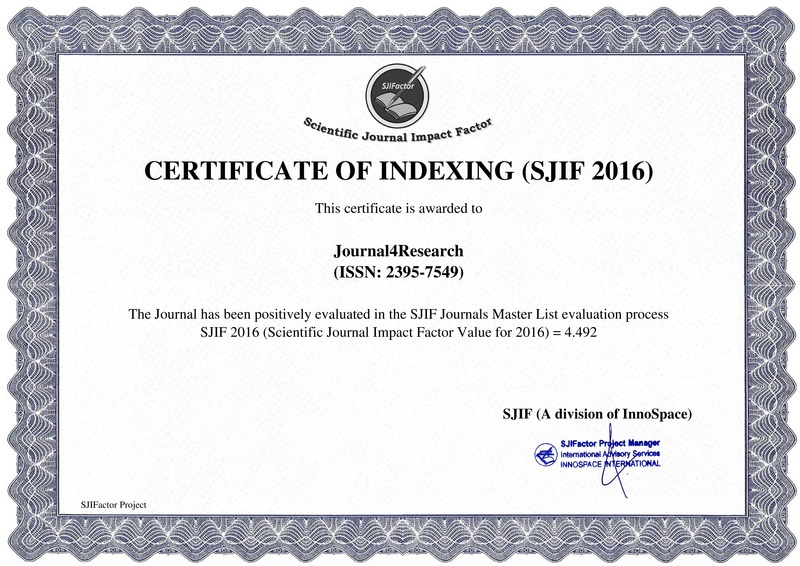 Journal 4 Research 2.7 (2016): 40-42. Rajendra Dattatraya Gaikwad and Prof. N. D. Khaire. "Self-Aligned Bearing Fault Detection using vibration Signals Analyzed by Spectrum analysis." Journal 4 Research 2.7 (2016): 43-47.